A little late I know, but here is the news of our secondary boys, I hope you enjoy it. This school year is a very special one for us as it is the first year that students have left us for secondary school. There is a recent initiative in Rwanda to extend basic education to 9 years and there is a building programme across the country to provide spaces for the students. If the students achieve good enough marks in the National Examinations then some of them will be able to attend local schools. Currently the very large majority of students attend boarding schools. The Primary school year started in early January but the children going to secondary schools had to wait for the examination results and to find out if they had allocated places. The boys came to us while they were waiting and set to work translating some of our story books into Kinyarwandan so that the teachers could read them to the nursery children in either language. This kept them occupied and was very useful for us too! Their level of spoken and written English is now very good indeed. They boys sat the exams at the end of October but we did not receive the results until late January. Secondary education is mainly only available for those children from families who can pay, or for those children who have sponsors. Those students who achieve the highest grades are directed by the Government to state assisted schools; others have to find places themselves. Some of the families would have difficulty in finding the fees for their children’s placements. Luckily for us, all our P6 boys have sponsors willing to assist them with the fees and to purchase the things they need. We are very grateful for this support. We had a week after finding out the results to find places for the boys.Two of our Primary 6 boys were allocated places. We had a challenging time finding places for four of the others as information was difficult to find, but eventually we managed to find a school which could take the four boys together. We were happy about this as they would be able to support each other. The list of things the children had to take with them included all the notebooks, pens, maths equipment and other school materials they would need for the year. They also had to have sheets, a mattress, nightwear, sports outfits, shoes, soap and toilet paper. Some had to provide cutlery, cup and plate. All needed a bucket and soap for washing their clothes. All of these things would be kept in a metal trunk. 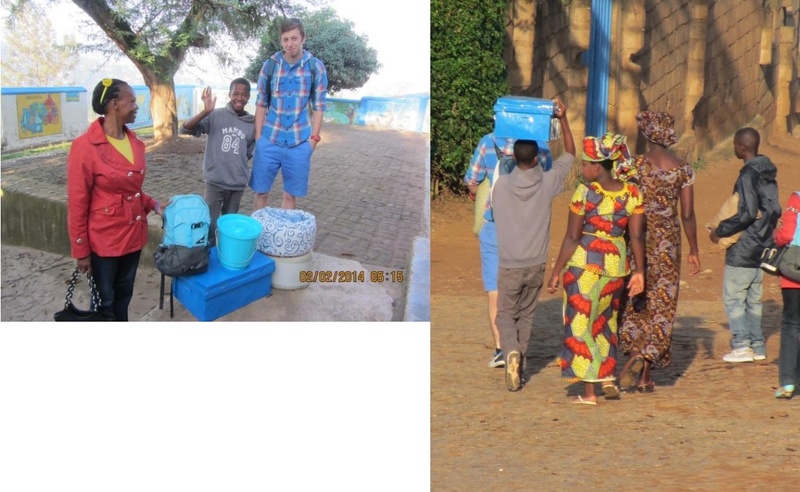 In the second picture below the boys are busy covering their notebooks with newspaper to keep them clean. On Sunday February 2nd we all set off in different directions. 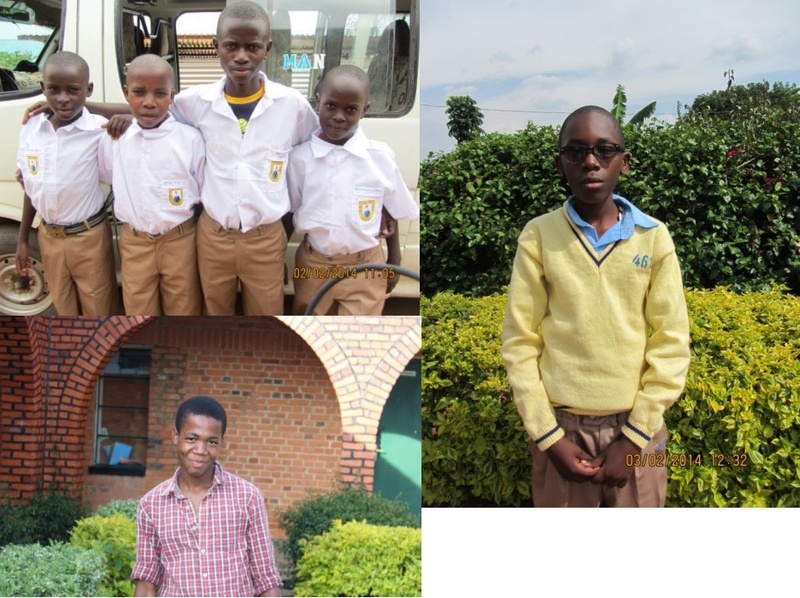 Two of the three schools are fairly near to Kigali, the third school is a very long and arduous journey across country. Andrew set off first with Jean and his mother to find a bus at Nyabugogo bus station which would be full of students all going in different directions. Francoise and Epiphanie walked with them to the road to set them off on their way. It was a very emotional time for all of us, most of the boy had been with us for seven years and they are an important part of our family. Ora had set off with his mother and I was going with the other four. We hired a minibus and were the last to leave. Boys, parents, Epiphanie and I squeezed into the bus with all the gear and off we went. At the school we went through a lengthy process of registration, equipment checks, receiving uniform etc. the boys were then shown to the dormitory which housed about 60 boys in two-tier bunk-beds. I had visited the school before when I was in Rwanda working for VSO. It is on a compact site, with large classrooms, a sport area, dining-room etc. As with many other schools there is more building in progress. We wish them good luck, we know they have had a good foundation upon which to build and I feel sure they will settle quickly, make new friends and work hard. My colleague Kath is going to visit them at the end of the first term and give us an update – watch this space!